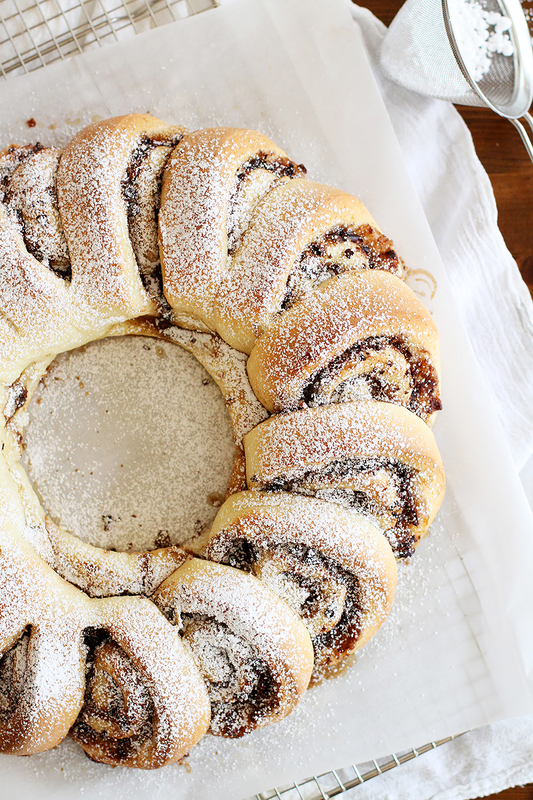 A light and fluffy sweet bread filled with swirls of rich dark chocolate and cinnamon. Toast a slice for breakfast with some butter or cream cheese. 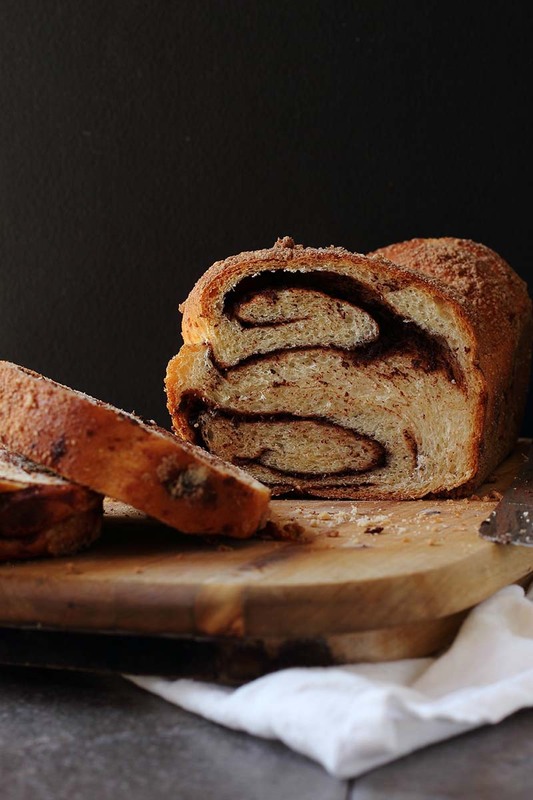 This chocolate babka would also make great French toast. Grease two 9 x 5-inch baking loaf tins with butter and set aside. In a mixing bowl combine the warm water and yeast. Whisk briefly to dissolve the yeast. Add the sugar, dried milk and egg and whisk to combine. Add 2 cups flour and mix together using a wooden spoon, until a dough is formed and there are no visible lumps. Let the mixture rest, covered with a towel, for 30 minutes. After 30 minutes, add the olive oil and salt. Mix with the wooden spoon. Add the remaining 1½ cups flour, mixing well until fully combined. Transfer the dough to a stand mixer fitted with a dough hook. Mix on low speed for about 2-3 minutes. Or knead by hand on a lightly floured surface for 5-7 minutes. Form the dough into a ball and place back in a greased bowl, cover and let rise for another 30 minutes. After 30 minutes, turn dough out onto a well-floured worktop and using a rolling pin, roll it into a rectangle shape about 12x15-inches. Spread the chocolate filling over the dough covering it well. Evenly distribute the 1½ tablespoons cinnamon on top of the chocolate filling. Starting on the short end, cut the dough in half - you will now have two 6x15-inch pieces. Take the long edge of each piece and roll it towards you like you would do with cinnamon rolls. You will have two long tube shapes side by side. Take each piece and twist them tightly against one another, tucking in the ends. Cut the 'braided' loaf in half and place each half in the prepared loaf pans. Bake for about 30 minutes or until the bread turns a deep golden brown. Let cool before slicing. Is there a way to substitute the dry milk powder? You can use milk (whole is best) in place of the water, and take out the milk powder. Thank you for your comment. We will find out if there are printing options that we can modify. In the meantime, try changing your printer to a darker print setting. Hopefully that will help.